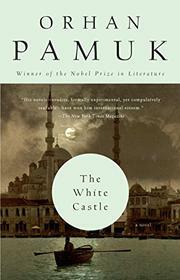 The American debut of a short (164-page), elegant, and intellectually provocative novel by acclaimed Turkish writer Pamuk--a novel that asks, in the voice of one character, "Why I am what I am." A contemporary scholar publishes a recently discovered 17th-century manuscript that tells the story of an Italian student, captured by Turks and brought to Istanbul. There, the student uses his medical knowledge, and instead of being sold as a galley-slave is bought by a teacher called Hoja. Hoja, though a few years older, bears an uncanny resemblance to the student. Anxious to acquire all the new learning from the West, Hoja insists that the student teach him all that he knows. Yearning to gain the sultan's favor, Hoja has conceived of a variety of projects that might advance him. The two men--who, as the years pass, have told each other everything of themselves and all each knows--have become barely distinguishable in thought and appearance. Together, they create an elaborate fireworks display for a celebration, give the young sultan advice, make predictions about the plague that rages through the city, and, when war breaks out, are commissioned to build a great weapon. This weapon, a monstrous hybrid of all that Hoja has learned about the West, is to be used against the White Castle of the sultan's enemies--but it fails, and one of the men flees to Italy. His true identity is suggested in an ending that itself raises further questions. A subtle fable--never ponderous, told in a vividly evoked setting--about the risks men take when they assimilate each other's cultures too completely.